The accurate impression of every detail of the prosthetic area is of extreme importance for the successful prosthetic restorations. One of the problems appearing in the process of fixed prosthetic restoration is the accurate impression of the marginal details. Contemporary dentistry uses hydrophilic impression materials (polyeter, A-silikone) allowing operation in damp environment. 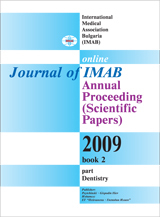 However, appropriate gingival retraction of sulcus gingivalis is of utmost importance, as even the most modern nano impression materials are unable to guarantee an accurate marginal detail. A high-quality impression that provides the necessary marginal detail is not only required for good fit, but also for optimal esthetic results. Key words: Polyeter impression material, A-silikon, retraction cords.